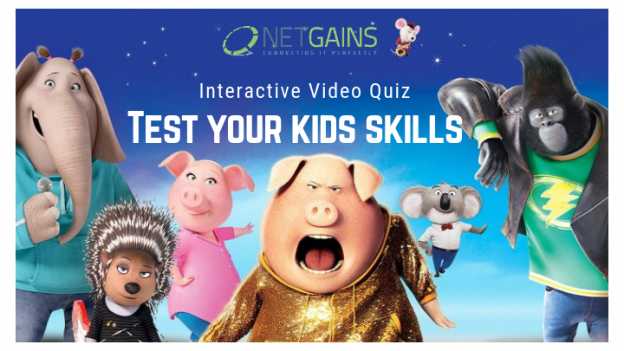 Interactive Video Quizz are highly engaging and motivating for kids to enhance their language and general knowledge (GK) plus they help improve kids listening skills too. Today’s lesson plannings are taking this new route to help make e-learning more interactive and effective. Below we have taken an interactive video created from one of the musical animation “SING” which your kid can use to enhance their skills. 1) What animal is this? 2) What type of consumer is an iguana? 3) Are snails invertebrates or vertebrates? 4) How do Crocodiles produce offspring? 5) What vertebrate group does a chicken belong to? Fill the gap: The grandpa is the ________________________ in the family. Fill the gap: The elephant sang the ________________________ in the room. 8) What vertebrate group does a frog belong to? 9) What animal is this? Fill the gap: The mouse is ________________________ than the monkey. 11) What animal is singing? 12) How do turtles produce offspring? 13) What invertebrate group does a Snail belong to? 14) Where is the porcupine? Also view Other interactive educational games created by Netgains.